Flex theme has support for one primary menu and one secondary menu. You can also display additional menu(s) using the custom menu widget. 1. 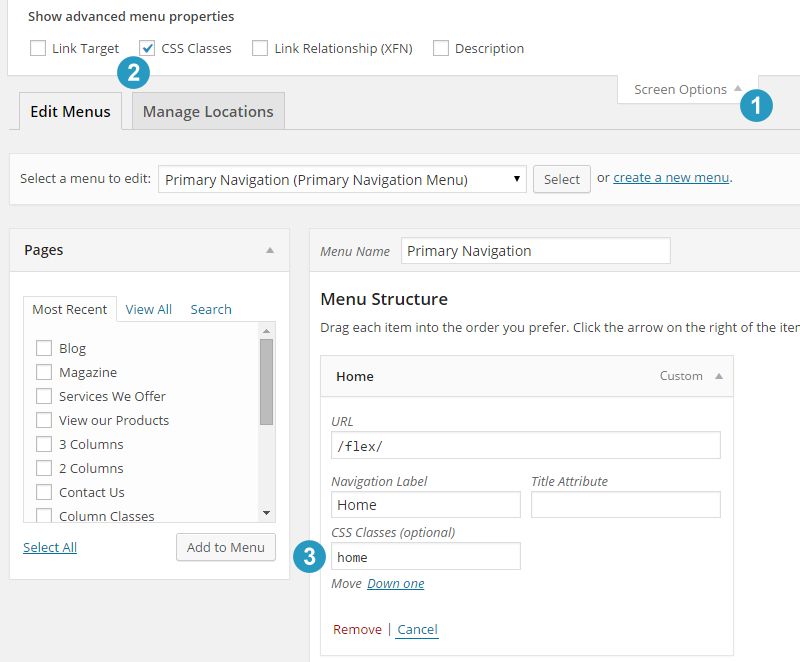 In WordPress Dashboard, go to Appearance > Menus option. 2. Select a menu that you want to set and display as Primary Menu from the drop down box. You can also create a new menu. 3. Select page(s) that you want add to the menu and then click Add to Menu button. 4. Now scroll to bottom of the page and click to check (tick mark) Primary Navigation Menu option under the Menu Settings section. 5. Click the Save Menu button and then your selected menu should start displaying under the logo header area (center aligned). If you activate ‘Primary Nav Extras’ widget then the primary menu will display left aligned. 1. You can display the home button icon in place of ‘home’ text in the primary menu. 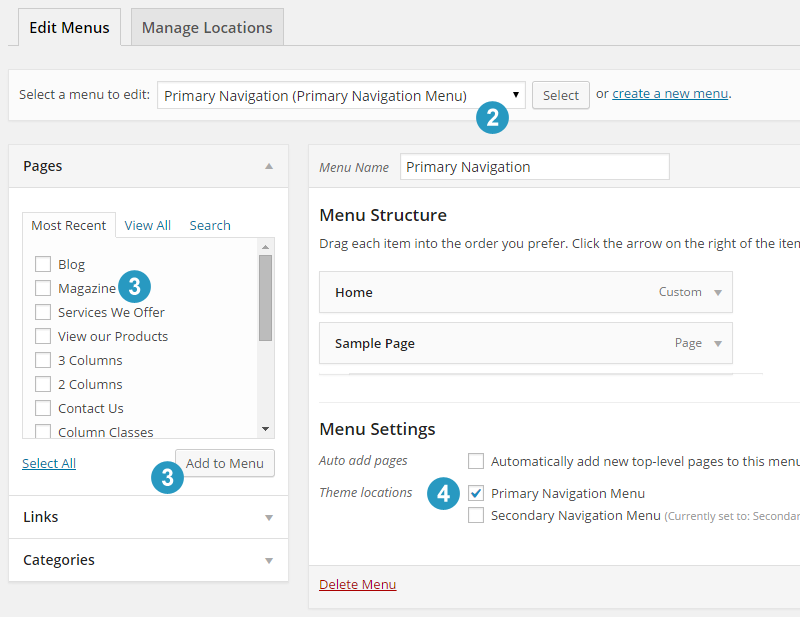 While on the menus page (see step 1 above), click the Screen Options button at the top right. 2. Click to check (tick mark) CSS Classes option in the expanded menu. 3. Expand the home menu item and type home in the CSS Classes box. Save the menu changes and you should see the home button icon. 1. Flex Theme has an additional widget area to add extra stuff at the right side of the Primary Menu. 2. In WordPress Dashboard, go to Appearance > Widgets. Then drag and drop a widget of your choice to the Primary Nav Extras widget area. Note: If you do not see the ‘Primary Nav Extras’ widget area, go to Appearance > Customize and then click to check Enable Extras Widget Area under the Primary Nav Extras section. 3. Due to limiting location of this widget, it is recommended to use only: social icons widget (via Simple Socials Icons plugin) or the search widget (displays in expand-able search icon format) in this widget area. 2. Select a menu that you want to set and display as the Secondary Menu from the drop down box. You can also create a new menu. 3. 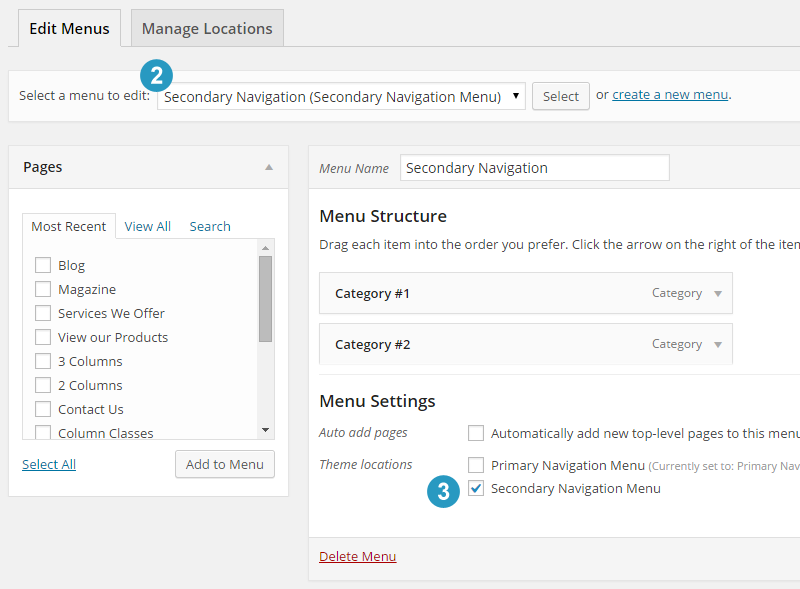 Once a specific menu is selected, scroll to bottom of the page and then click to check (tick mark) the Secondary Navigation Menu option. 4. Click the Save Menu button and your selected menu will display in the bottom area above the footer widgets section. Note: Procedure is exactly same as the ‘Primary Navigation’ menu, just select ‘Secondary’ in place of the ‘Primary’ menu.